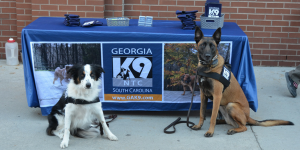 GAK9 South Carolina dogs and trainers will be at the Charleston Riverdogs home games every Monday night! Come to our table near the concessions area to talk about dogs and dog behavior. GAK9 dogs retrieve bats off the field during the second inning of home games. Czabin, is a Belgian Malinois, certified for explosives detection, and Havoc is a German Shepherd certified for narcotics detection. 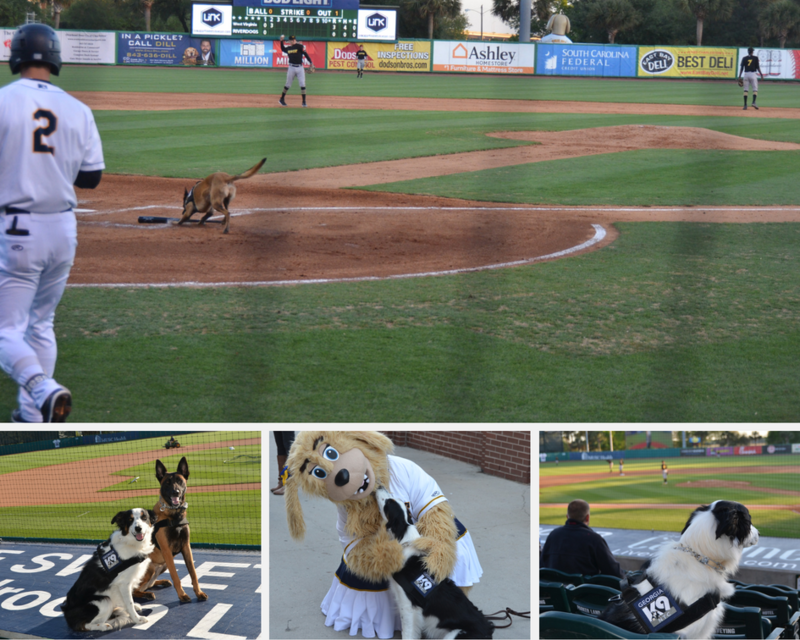 Both dogs trained by GAK9 entertain fans as they retrieve bats off the field during the second inning. 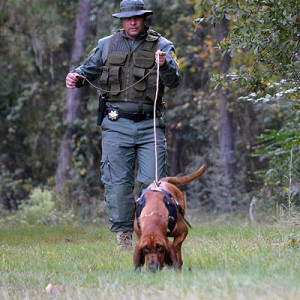 GAK9, located on Edisto Island, is the South’s premier K9 training company. 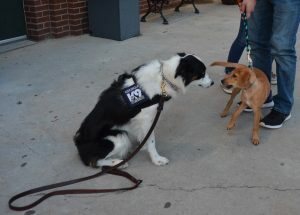 Our trainers have nationally recognized dog handlers and our clients are nationwide! We pride ourselves on our knowledge and experience with dogs and offer information on every breed of dog and every behavior problem. We have a staff of certified professional trainers that will teach your dog proper behavior as well as help educate you, the owner, on how to fairly and effectively communicate with your dog. Whatever your needs may be, GAK9 trainers will work with you to achieve the relationship you have always wanted with your dog. Our Obedience Training begins with Puppy Preschool and offers programs through Elite Obedience, giving you control of your dog off leash under distractions. Our Environmental Training and Socialization program will give you and your dog confidence to spend time in all types of public places with many types of distractions. So please accept our invitation and look for GAK9 dogs and trainers at the game. We welcome you to come by our table and let’s talk about dogs! For more information on our Obedience Training please click the link below. Human grade ingredients are those that meet standards for human consumption and undergo stringent testing protocol to ensure quality and the absence of anything not fit for human consumption. Feed grade ingredients are those deemed not fit for human consumption. They include expired, moldy, and defective products. 1. Dog food manufacturers are required to list all of the ingredients in their foods. Each ingredient must be listed in order from highest to lowest by weight. 2. Some commercial manufacturers bypass the above standard to cover up less desirable elements. An example would be when a reader groups all of the wheat components together and they become substantially more than the meat product, such as lamb. Now the wheat becomes the primary ingredient. Animal digest is a cooked down broth that might be from unspecified parts of unspecified animals. These creatures can be collected from almost any source and there are no quality controls in place. Dead, dying, diseased, and disabled, (known as 4-D) protein sources that are banned in human food can legally used in dog food. Unspecified by-products often times are an element of a larger product; e.g. waste elements such as hair, feathers, feet, claws, beaks, etc. These byproducts are not part of a healthy diet. **Meat byproducts such as the heart and liver are perfectly acceptable byproducts Dry blood meal is an inexpensive source of poor quality protein in some foods and it is completely indigestible. For the most part, pet foods are overcooked and their nutritional value is often compromised. Things have to be added back in to the mix to make it more palatable. These ingredients are fall under the GRAS guidelines, (Generally Recognized as Safe). This does not necessarily mean they are good for your dog. BHT- Used to retard spoilage. Some research has linked BHT to immune deficiency syndrome, spleen, stomach, and liver cancer, chronic diarrhea, liver and kidney damage. Ethoxyquin- A known carcinogen that some studies have shown creates numerous other major health issues. BHA- Some studies have shown this to be harmful to kidneys. Corn syrup- This is pure sugar and can create picky eaters. 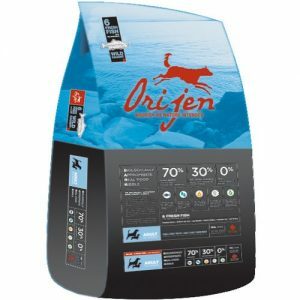 We stock Orijen , Acana and Honest Kitchen in 30 LB bags for our customers. However, for those out of the area, repeat purchases might be best through one of our affiliate pet professionals in their particular neighborhoods. Please ask for a referral. We are also proud to feature Omega QD, the absolute best Omega fish oil supplement on the market. Ask a Georgia K9 Trainer for a custom designed diet for your dog. Another GAK9 Hound find…they are coming every day! Great work Mike Mason and Deja from San Bernardino County Sheriff’s Dept. Officers responded to the US Bank regarding a reported critical missing. RP XXXX reported that her mother XXXX (DOB: 040444) had walked away from the RP’s parked vehicle. XXXX suffers from advanced Alzheimer’s. An extensive area search was conducted by officers to include the use of Red Hawk 1, Detective personnel and an SBSO Bloodhound team. The Bloodhound team (Dep. Mason and K-9 “Deja”) tracked the critical missing throughout the Village of Heritage. Det. Goltara along with patrol officers searched the area on foot with the K-9 Team. The track concentrated in the northeastern portion of the village. Prior to establishing a Command Post, K-9 “Deja” tracked the critical missing further east in the village and subsequently across Cherry, to the walking path between commercial warehouses. The critical missing was unharmed and in apparent good health. Com Center responded to check XXXX as a precautionary measure. XXXX was reunited with her daughter and removed from MUPS. Great job by everyone involved!